Whole grains. We all know they are good for you. 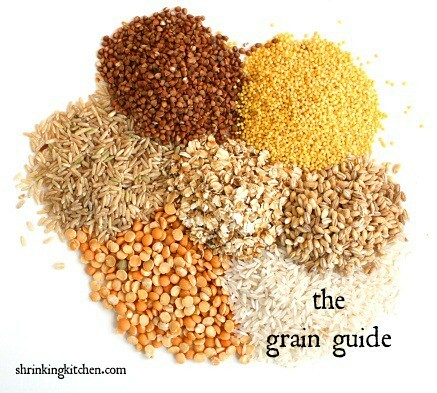 But do you know exactly what whole grains are, how to prepare them, and how many different varieties there are? No? Well, never fear. I’m here to give you the lowdown. First of all, what exactly makes a grain whole? To be considered a whole grain, the product must contain all three parts of the entire grain kernel: bran, germ and endosperm. Most refined, bleached or processed grains lack one or more of these essential components – and are far less superior nutritionally speaking. Now. Allow me to introduce you to the wonderful world of whole grains! Barley: Barley has a springy texture and a creamy, mild flavor. It’s sold in two forms – hulled, which is a whole grain, and pearl, which cooks faster because the bran is removed – so it’s not a whole grain. Barley is a high fiber food, contains eight amino acids and is thought to regulate blood sugar and lower cholesterol. Use it in soups, as a side dish or in salads. Beef and Barley soup is a classic! Bulgur: Bulgur is steamed, dried and cracked wheat. It has a nutty flavor and is a good source of potassium, iron, B vitamins and calcium. It has the same amount of protein as brown rice, but less fat and more fiber. Bulgur is a Middle Eastern favorite and is wonderful in salads. Try it in this Lemon Tabbouleh recipe. Farro: Farro is soft, yet slightly chewy, with a delicate nutty flavor. It is low in gluten and high in vitamins A, B, C and E. It is often used as a subsitute for arborio rice – make a farro risotto! Or try it in a side dish like this Farro with Thyme, Mushrooms and Balsamic Vinegar. Kasha: Kasha is toasted buckwheat groats. It has a musky/sweet flavor, is gluten free and high in antioxidants and fiber. It pairs well with richly flavored foods. This recipe for Kasha Varnishkes looks super yummy – total comfort food! Quinoa: I adore quinoa. It is quick cooking – about 10 to 15 minutes – and has a mild, nutty flavor. It is a complete protein containing all nine essential amino acids. Quinoa is super versatile – it is great in a warm side dish, in a salad or even in patties like our Crispy Quinoa Patties! Wheat Berries: Wheat berries are minimally processed, have a sweet, nutty flavor and a chewy texture. Rich in fiber, protein and vitamin E and iron, use wheat berries to temper and complement salty ingredients, like bacon. Yes, bacon. This Wheat Berry Salad with Bacon looks delish! Brown Rice: The difference between white rice and brown rice is processing. Brown rice still has the bran layer – and is nutritionally superior. Since brown rice is minimally processed, it has a shorter shelf life – about six months in an airtight container. Use brown rice whereever you’d use white. It takes a little longer to cook, but is so nutty and delicious. This Southeast Asian Fried Rice sounds divine. Wild Rice: Wild rice is actually not directly related to brown (or white) rice. It is high in fiber, protein and lysine (an amino acid). Try these Wild Rice Stuffed Acorn Squash as a meat free holiday dish. Whole Cornmeal: Whole cornmeal is high in fiber and protein. Obviously, use it in cornbread! Or, check out these Whole Grain Waffles with Cherry Sauce. Uh, yum? Popcorn: Yep, it’s a whole grain! Just avoid movie theater popcorn. All the gunk (admittedly DELICIOUS gunk) kind of cancels out any health benefits. But air popped popcorn with a sprinkling of nutritional yeast? YUM. And good for you. Fiber filled. Oats: Oats have the most soluable fiber of any grain. They are shown to reduce cholesterol and are also high in protein. Oats are great in breads, cookies, and, of course, oatmeal. Try our Overnight Apple Pie Oatmeal for a quick, hearty breakfast. So, there you have it! I hope you’ve found this guide informative and now I fully expect you to hit the bulk aisle at your local supermarket and stock up on some grains! Experiment. And tell us, what grain are YOU going to try?